Fun side story about finding the right tools for a do-it-yourself repair. 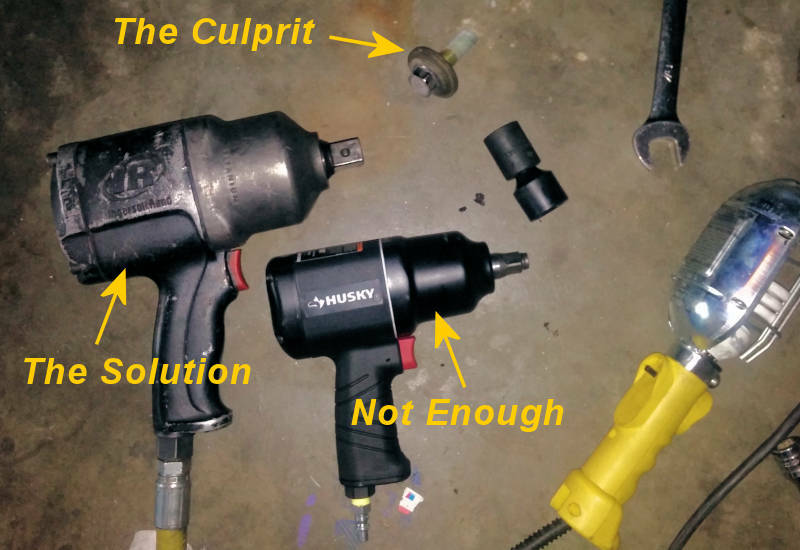 This story is not about building great Do It Yourself projects, but it illustrates the need to have (borrow, or rent) the right tools for the job. And, though it was a bit frustrating at the time, the story is funny in a warped sort of way. The other day a friend called about a crankshaft bolt he was trying to remove. 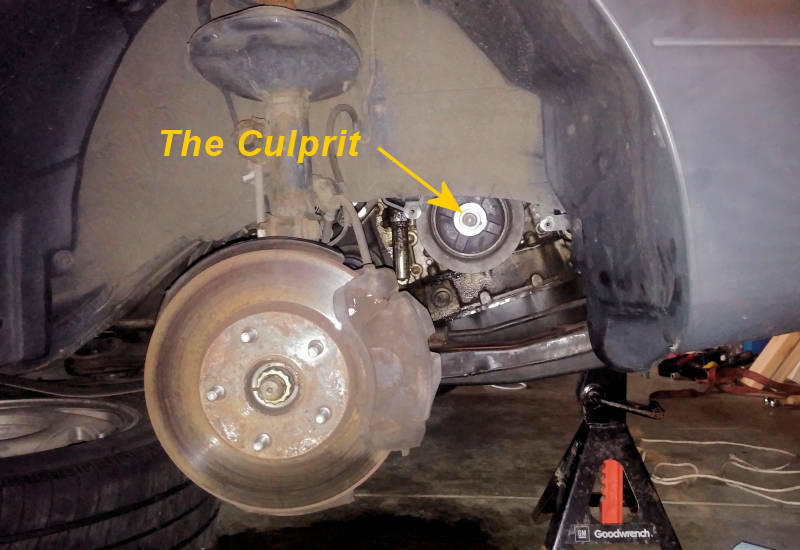 He was fixing his wife’s Toyota Sienna, but couldn’t remove the bolt from the end of the crankshaft. (The bolt that holds the belt pulley on.) He said he had tried everything including his electric impact wrench. Of course, I’m always up for helping a friend, so over I went with some big tools: a large wrench, a longer cheater, and an even longer pry bar. Well, it wasn’t that simple. After some huffing and puffing all we did was snap the timing belt. Well, that’s certainly one way to make the problem bigger. So we stopped to think a little. The bolt really requires an impact wrench because the engine turns if you apply a big torque. His electric impact wrench is capable of 400 ft-lbs. We checked the bolt speck, and the bolt supposedly requires 550 ft-lbs to remove. Well, no wonder it didn’t come out with the electric impact wrench. (Though, I’m pretty sure we put more torque than that during the process that broke the timing belt.) Oh well. “Well, that’s not a problem” I say with confidence. It was a little inconvenient, but we loaded the air compressor into the truck, then returned to his place to attack it with air. My pneumatic impact wrench says it is good for 650 ft-lbs, so we were confident as we ran the big extension cord into his house, behind the electric range to tap into the 220VAC to run the compressor. Yeah, that’s a bit of a hassle, but you gotta do whacha gotta do. When you do it yourself, sometimes you’ve got to think a little different. After hammering with the impact wrench for several minutes (and waiting for the air compressor to refill a couple times) we jacked the air pressure up from 100 psi to 120 psi. Theoretically, that should give an additional 20% torque, but STILL nothing. Ouch! Have you ever tried to rent a big impact wrench? I think I called every tools rental shop in Colorado Springs, but nobody had one. All I wanted was a 3/4″ monster! (Think Tim Taylor with his deep Huh, Huh, Huh!) You see these big impact wrenches all the time, but apparently there’s not enough demand to have one in the rental inventory. Or, maybe folks just don’t return them, because there was nothing in town. He’s the hero of this story. Turns out the Denver store has one. Just one. So, they promised on the next trip to Colorado Springs they would have the runner bring it down. Chalk one up for United Rentals. A big THANK YOU for that! That was probably the most expensive 3 seconds I’ve ever lived. After swapping fittings, we hooked it up to the air compressor, then one blurp later the bolt was sitting on the floor. With tax, the rental was $79.18, and it was only needed for 3 seconds — maybe not even that. There’s always something new to learn when you do it yourself. Yup! Confirmed again. The right tools make all the difference. Put this one down in the Wanda Hickey Book of “Don’t remind me“. Ain’t DIY fun! Yeah, it’s frustrating in the middle of it, but it makes us smile when the job is done. Now the questions: I wonder if I’ll ever need one of these again? Should I go buy one just incase? Or, if I do, will it just sit in the tool chest collecting dust? Such a dilemma!